Recharge batteries with wee. Yes, wee. 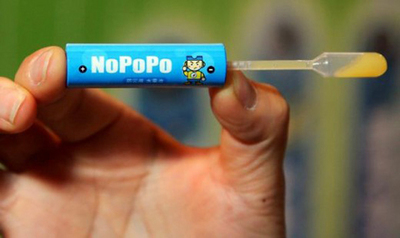 The NoPoPo battery is a revolutionary new battery from a Japanese company called Aqua Power System which consists of magnesium and carbon, and can be recharged with a ‘variety of fluids’, including urine. The batteries will also accept beer, apple juice, cola and saliva, via a pipette included in the pack. A typical AA battery carries 1700-3000 milliamp-hours of charge, whereas the NoPoPo – which stands for no pollution power- only holds 500 mAh, but when all you need to do to recharge it is squirt in some piss, you can’t argue too much. The NoPoPo batteries are available in Japan, and you might be able to get it from the States here for $15. If you’re buying some, though, I demand you explain in the comments exactly why you need wee-powered batteries, you weirdo. 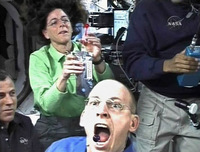 You wouldn’t think people would ever be pleased to hear they can start drinking their own urine – but the astronauts on the International Space Station are currently over the moon about it. “There will be dancing later,” Mission Control said, after ISS commander Mike Fincke told Earth that the the orbiting station’s faulty urine processor – which filter space wee, condensation and SWEAT and turns it into lovely drinking water – was finally fixed.